MR. BIG have announced that they will release their new album, entitled ...The Stories We Could Tell, this September via Frontiers Records. Frontiers Records stated: "We just heard from the MR. BIG camp that the new album coming in September will be called ...The Stories We Could Tell. Don't know about you guys, but we are quite psyched to hear what Billy Sheehan, Paul Gilbert, Pat Torpey and Eric Martin have in store for us all. Look for your first taste of new music later this summer!" 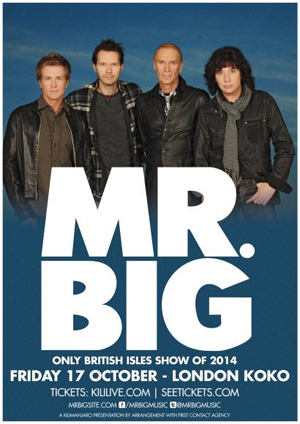 MR. BIG have also announced a one-off show at London’s Koko on Friday, October 17th - their only show in the UK this year. The original lineup of super-piped vocalist Eric Martin, shred legend Paul Gilbert, bass god Billy Sheehan, and powerhouse drummer Pat Torpey will perform songs from their vast catalogue, spanning nearly 25 years. With huge tunes such as “Addicted To That Rush”, “Green Tinted Sixties Mind”, “Undertow”, “Ain’t Seen Love Like That” and of course their 1991 smash hit “To Be With You”, this exclusive British Isles show is unmissable for any MR. BIG fan. Tickets go on sale 9 AM, Friday June 27th and are available fromkililive.com and seetickets.com.